French Onion Chicken Quiche - seriously delicious! Chicken, french onion dip, cheddar cheese, french fried onions, eggs, and heavy cream. Can make ahead and freeze for later! 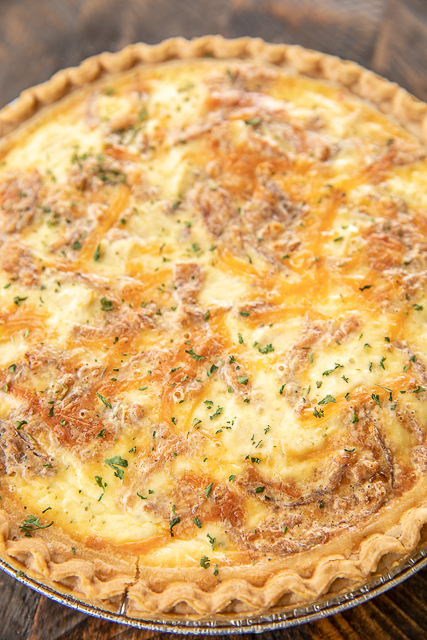 Everyone LOVES the flavors in this yummy quiche!! I usually double the recipe and still don't have any leftovers! Just add a salad and dinner is done! Quiche is a favorite in our house. While you might think of quiche as a breakfast dish, we love to eat it for lunch and dinner too. I am always coming up with new quiche flavors for us to try. 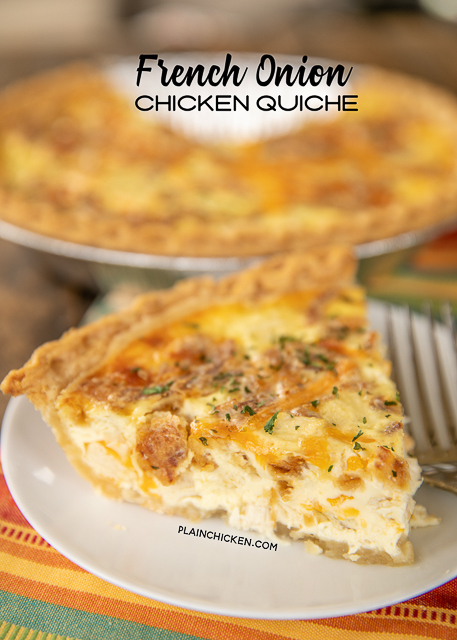 I made this French Onion Chicken Quiche last week for lunch and it was a huge hit! Chicken Legs & I almost finished the whole thing by ourselves. It was SO good!!! Quiche is actually very easy to make. Place the chicken, cheese and French fried onions in the bottom of the crust. Next, whisk together the eggs and cream. Pour that over the chicken and bake. Easy! How do you know when the quiche is done? It will puff up and won't be jiggly in the middle. 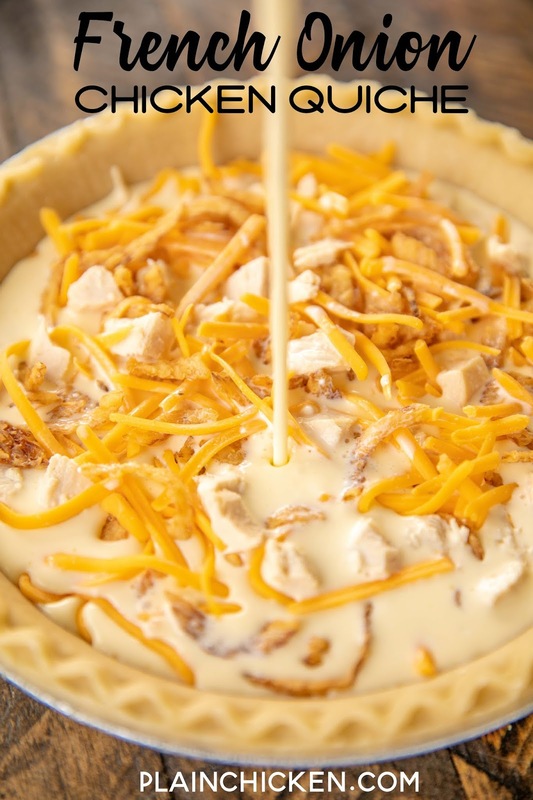 I always use a frozen deep dish pie crust for my quiche recipes. There is no need to prebake the crust. It will bake along with the quiche and be perfect. The french onion flavor comes from a container of French Onion Dip. You want to look for a sour cream based French Onion Dip. I prefer Kraft, but any of the refrigerated sour cream based French Onion dips will work great. Just use your favorite! Absolutely! You can make this French Onion Chicken Quiche ahead of time and freeze unbaked for later. When you are ready to bake the quiche, thaw it completely in the fridge and bake as directed below. I always have at least one quiche in the freezer for a quick meal. You can also freeze any leftovers. I like to cut the leftover quiche into slices and freeze them. I wrap the slices in plastic wrap and store them in a ziplock freezer bag. Just thaw and reheat in the microwave when you are ready to eat. What to Serve With Quiche? 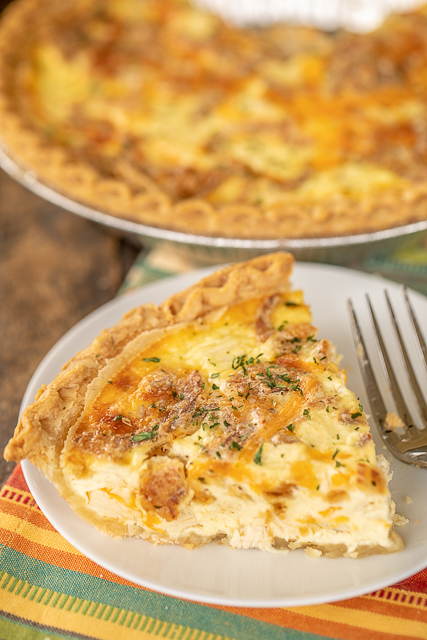 We love this French Onion Chicken Quiche for lunch or dinner. All you need is a simple salad or side dish and you are set!! Like I said, the two of us almost finished off the quiche by ourselves. You might want to double the recipe if you are feeding a crowd! It goes FAST! Spread cooked chicken and french fried onions in the bottom of pie crust. Top with shredded cheddar cheese. Whisk together eggs, heavy cream, and french onion dip. 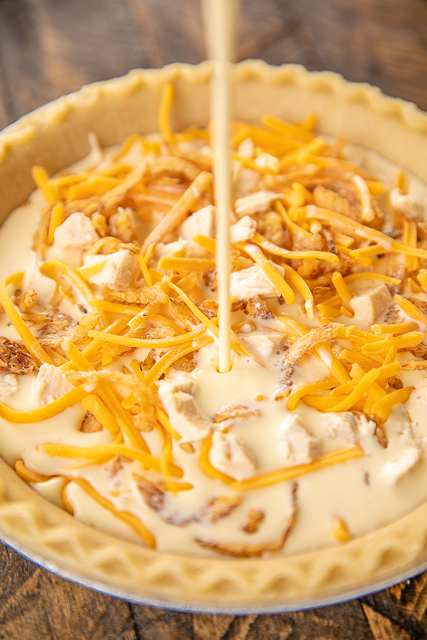 Pour egg mixture over chicken and cheese mixture in pie crust. I've never used chicken in a quiche but I will now - looks delish! Looks delicious Steph - I could eat those onion rings on about anything. Would using the French Onion Soup mix with sour cream work? Absolutely,that's what I do...works perfectly! Oh, YUM! Another great recipe to try. Thanks for sharing.